When a patient has a good occlusal relationship and a good tooth proportion or good length to width relation but still shows excessive gingiva when they smile, the distance the lip travels superiorly can enhance their smile. In this program, Dr. Michael Skinner will perform a lip travel reduction or a vestibular obliteration. In this program Dr. Skinner will describe patients who typically have excessive gingival display and demonstrate the corrective action on a live patient. Identify three patients who typically show excessive gingival display. State the ideal length the lip should travel superiorly. Describe the technique used for the dissection of the epithelium from the vestibule and the insertion of the tissue graph. Part 1 - We look at who the three best candidates are for lip travel procedure. Part 2 - Dissecting the epithelium and why this should not be rushed. Dr. Skinner demonstrates the dissection of the epithelium in this section of the dental continuing education course. Part 3 - Harvesting the connective tissue graft. 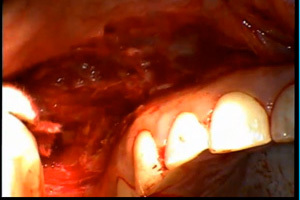 In this section of the CE course, Dr. Skinner demonstrates how the connective tissue graft is harvested and then placed using a superperiostal subepithlelial tunner or subconnective tissue tunnel.